Watching your loved one slowly deteriorate health-wise is not easy, especially if it’s a condition you have no control over, such as dementia or Altzheirmer’s disease. Dementia is when normal daily functions and processes are interrupted. Altzheimer’s disease is an irreversible, progressive brain disorder where the cells in the brain die, which destroys memory and cognitive processes, making the ability to carry out the simplest tasks virtually impossible. You probably feel helpless and, at times, at a loss as to how to help. The time may come when you are no longer able to provide care for your loved one suffering from a condition that impairs brain functioning. The decision to entrust the care of your loved one to a third-party is difficult. You probably have mixed feelings from guilt and relief to fear and dread. Serenity Gardens in Friendswood, TX, is a family-owned and -operated residential memory care facility that specializes in dementia assisted living and helping others suffering from memory loss. Our mission is to create a home environment, so your loved one feels at home at our home. Below, we offer up the common signs to look for when deciding whether your loved one needs assisted living facilities. Contact us today for a free tour of our memory care facility! Safety. Those suffering from degenerative conditions, like dementia or Altzheimer’s disease, can become easily confused, creating safety issues. If you’re afraid your loved one may wander away from home and become lost or put themselves in harm’s way, such as stepping in front of a car, it may be time for a memory care facility, where your loved one can be accounted for 24 hours a day, 365 days a week. This can apply to whether your loved one is still living by himself or herself or if your loved on is living with you. Health and well-being. 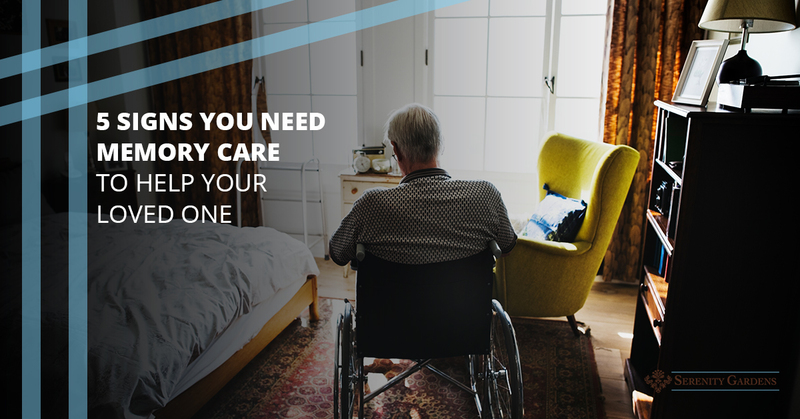 If your loved one is forgetting to take medication, forgetting to eat, forgetting to shower, and forgetting other sanitary issues that may affect their health, it may be time for a memory care facility. At Serenity Gardens in Friendswood, TX, we provide three homemade meals a day for our residents as well as ensure they take their medication at the proper times. Living environment. One of the common symptoms and behavior changes of dementia and Altzheimer’s disease can be hoarding. This is caused by a fear of items being stolen or just a forgetfulness that items are already owned. If your loved one is endangering himself or herself by packing their home full of clutter, creating a tripping and fire hazard, it may be time to investigate a memory care facility. Bugs and rodents can move in if forgetfulness leads to a trash problem, which creates a hazard to one’s health. Peace of mind. If your loved one is living with you and your life is insanely busy, allowing little free time to be with your loved one, it may be time to try an assisted living facility specializing in memory care. You may feel guilty you are leaving your loved one home alone all the time, and you may be excessively worried about the health and safety of your loved one suffering from a degenerative brain disorder, which in turn impacts your health as well. Caregiver burnout. Caring for others can be physically and emotionally exhausting. Besides running your life, you’re also running the life of your loved one, making doctor’s appointments, making meals and possibly feeding your loved one and providing basic care, such as assisting with baths. You are also dealing with the fact your loved one may not remember who you are. You may be stressed, exhausted, and feeling overwhelmed. Senior living facilities specializing in memory loss care can give you a break and perhaps your life back. Memory care is a form of long-term care facility and can be either independent assisted living facilities, such as Serenity Gardens, or it can be a part of other assisted-living care facilities housed separately. Memory care facilities specialize in caring for patients with Alzheimer’s disease, dementia, and other types of memory problems. Also called special care units (SCUs) if part of another assisted-living facility, memory care usually provides 24-hour supervised care. The staff is trained to deal with and look for conditions distinctive to those suffering from memory loss. Usually, the living environment is carefully configurated to minimize wandering behavior but remain pleasant. At Serenity Gardens, our mission is to create a home for our residents. Family, pets, and children are always welcome. We attend to the basic needs of all of our residents, from providing nutritious meals and making sure medication is taken to emotional and physical needs. We keep our residents active and engage with them daily in conversation and mirth. Serenity Gardens prides itself on being a compassionate and caring environment for all of our residents. We invite you to take a tour of our facility if you’re on the fence about investing in memory care for your loved one. We are happy to answer any and all questions and perhaps ease some of your concerns when it comes to entrusting a caregiver with your loved one. We understand how difficult dealing with degenerative memory disorders can be, and we’re here to help you manage the transition to senior care and find the best memory care facility for your loved one. Contact us today for a tour!